The sixth Hakawy International Arts Festival for Children (4-14 March) invites the youngest audience members to attend various theatre performances staged at three halls of the Hanager Arts Centre. 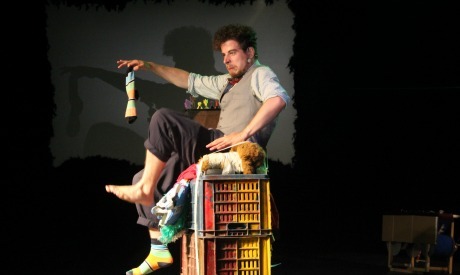 The festival kicked off with Aga Boom by the Theatre of Physical Comedy from the USA. As it continues, shows from Germany, Switzerland, France, and Australia are being performed several times. Another aspect of the festival is the artistic cooperation between Sweden and Egypt represented by the Awtar Quartet, which resulted in Jinane, a performance that fuses music and storytelling. The festival also includes workshops and an exhibition by the young Egyptian artist Khadija El-Dessouky. Hakawy has featured numerous countries and performances in past years, luring whole families into the theatre. But this year features the first contribution by Australia, Stick Stones Broken Bones by the Bunk Puppets troupe, a show that incorporate an original and internationally successful shadow comedy technique in which the puppeteer performs in front of the screen on which the shadows are projected, not behind it. In an almost one hour long experience, the audience is transported into a fun world where mime, clowning and puppetry meet. 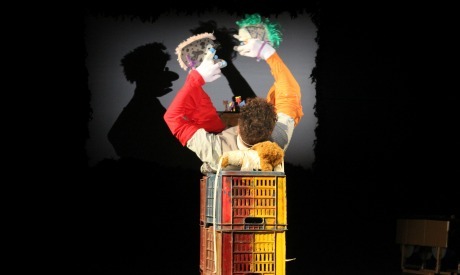 It is also a fascinating amalgam of theatrically constructed and precise elements beautifully juxtaposed as the props turn into the characters, coming alive to create the stories, and the audience is invited to actively interaction with both puppeteer and shadows. Stick Stones Broken Bones was created by Jeff Achtem and represents one of four shows the 15-strong Bunk Puppets, who include musicians as well as actors. Though it has been in the company’s repertoire for 15 years, Tim Sneddon, who captivated the Egyptian audience with his energy and dynamism, has only performed it for two years. It is such fascination that enables a creative professional who, though an adult today, can locate the child in each of us. Still, Sneddon believes that art plays a vital role in mental formation. While the children watch Stick Stones Broken Bones, commenting and laughing, the performance proves to be fun for the rest of the family, challenging the adult imagination as well. At the theatrical level, the performance projects several levels of viewing experience: the audience watching a puppeteer; the puppeteer using different props as characters; and the characters creating scenes projected on the screen. The show uses several materials that are present on the stage, most of them brought with the company, yet some picked from the local market. Performed by one person and without recourse language, Stick Stones Broken Bones reaches out to the audiences of all backgrounds, cultures and ages, keeping all communication channels open. “In China, for instance, I used more pantomime than in Cairo. In Egypt, I found a lot of interaction with the audience. There is a lot of buzzing energy in the Egyptian viewers, they respond to my movements so, in return, I engage back with them. All those elements feed the show and make each staging different,” he says. Not only is the show very flexible as it adapts itself to the space and the culture, it can also be adopted by many stages, enjoyed in an intimate setting of a small theatre as well as in a large hall with an audience of over 1,000. As Sneddon explains, the screen can take any size and will still give the same effect. 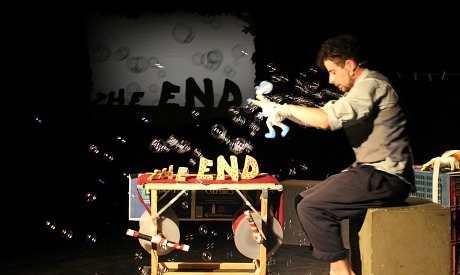 In Egypt, children’s theatre still needs a lot of work and a festival such as Hakawy is among the most important initiatives responding to the youngest audience. The complete circle that nurtures children with art involves many parties: families, education systems that recognise the importance of theatre and art at large, artistic institutions and creative individuals willing to invest their time and resources into theatre for children. While some actors focus on performances targeting adult audiences only, Sneddon invites them to try exploring theatre for children. The energy of Stick Stones Broken Bones continues to spread around the world. The popularity of the show took it to countless countries, including dozens of performances in Europe. In the upcoming months, the show will move to other destinations. “We tour a lot. Shortly after Egypt, I will be going back to China, as well as Korea, the United Arab Emirates, then Switzerland and Norway,” Sneddon announces. 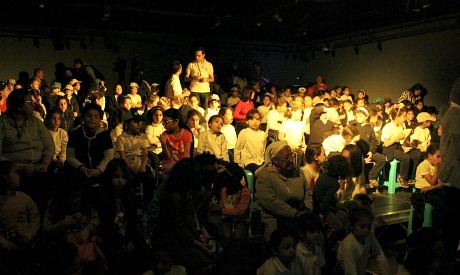 Cairo’s final performance of Stick Stones Broken Bones took place last Tuesday, but the Egyptian audience still has the opportunity to catch other performances offered by the Hakawy International Arts Festival for Children before it wraps up on 14 March.